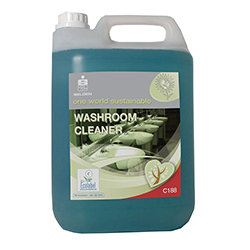 General washroom cleaner for all hard surfaces within the washroom. Cleans rapidly and effectively, whilst controlling and preventing the build up of lime scale. For the regular cleaning of ceramics, painted surfaces, stainless steel, floors, all non-porous surfaces in hotels, sports complexes, conference centres, institutions etc. Use throughout the washroom on washbasins, mirrors and stainless steel urinals. Composition An acidic blend of surfactants, incorporating a fresh perfume.